Consider ALL COSTS for studying abroad. To avoid suffering from “sticker shock,” it is important to evaluate what is included in program fees and how study abroad compares to a regular term at Auburn University. The cost of study abroad programs vary dramatically by location, duration, and services included. Some programs may be less expensive than attending regular courses at AU while some may be more expensive. Remember you are not double charged tuition, housing, or dining fees at Auburn University on top of your study abroad program fees. Complete an Auburn Abroad Budget Estimate Planning Worksheet to evaluate standard program fees, accommodations, meals, excursions, and travel costs for programs of interest. Compare the cost of study abroad to the cost of attendance at Auburn University. Understand how your current funding sources will transfer to study abroad costs and apply for other funding to cover additional charges. 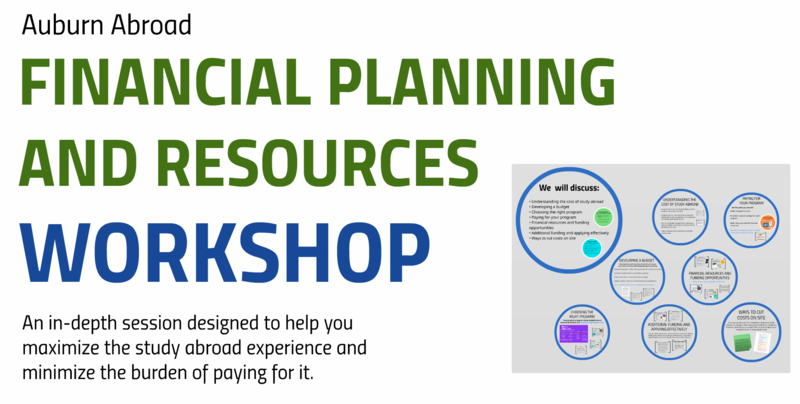 Refer to the Financial Resources and Planning Workshop presentation for detailed advice. Program costs, payment deadlines, and withdrawal penalties are posted on each program’s online brochure in the Program Search. All charges for Auburn study abroad programs are billed to the student's bursar account (eBill). If you are applying to a non-Auburn study abroad program, charges will be billed separately. Typically, you will need to cover all or most costs for your study abroad program months in advance of your program start date, even if you are expecting financial aid or scholarships to be released to you before the start date. Federal student aid programs, such as the Pell Grant and Federal Direct student and parent loans, can be used to pay toward an approved study abroad program with appropriate documentation from Auburn Abroad. Contact Student Financial Services for eligibility information. University scholarships may be used to help fund study abroad programs under certain conditions. Contact the Office of University Scholarships to verify requirements. Alabama Pre-Paid College Tuition (PACT) can be used to help fund your study abroad experience. PACT pays per credit hour the same rate as a course on campus. It is likely that students will need to pay for program fees before they receive their PACT funding. Federal VA education benefits (such as the GI Bill) may apply to certain study abroad programs. You can also look for scholarships through your academic department and college, your program provider (for those studying with a third-party-program provider), government grants, and national prestigious scholarships. To maintain full-time student status at Auburn University during the term abroad, students are enrolled in an Auburn Abroad placeholder course. A registration fee called the Auburn Abroad Fee is assessed in addition to the applicable program charges, and this replaces the regular Student Services Fee during the student’s term abroad. *If none of these conditions apply to a student participating in a non-Auburn program during the summer term, the student can choose to decline enrollment in the Auburn Abroad placeholder course. Note that academic transfer credit can still be earned if the student does not enroll, but an Auburn Abroad online application must be completed for approval. By choosing this option, the student will be participating in the program completely independent from Auburn University and will not be covered under the Auburn University International Insurance. See below for a listing of study abroad scholarships supported by various colleges and departments at Auburn University. Students may be able to apply for scholarships through other colleges and departments even if they do not have a major in that specific discipline. Each scholarship has a different set of requirements and eligibility. Please note: Most scholarships stick to an annual deadline between February 15th and March 15th even if you are applying for a fall or spring term study abroad program. Various scholarships are available for students participating in College of Human Sciences study abroad programs. Students wishing to be considered for scholarships for the Joseph S. Bruno Auburn Abroad in Italy program must have already submitted the application and paid the non-refundable deposit. Please visit the Office of Global Education in Spidle Hall for more information. Scholarships are available for Harbert College of Business students participating in study abroad programs. Eligible students should apply through AUSOM. Various scholarships are available for Honors College students participating in study abroad programs. Contact an Honors College advisor for more information.